399 in stock Need More ? Knock Knock Vouchers are classy, clean, and reject saccharine sentiment in favour of real affection and utility. 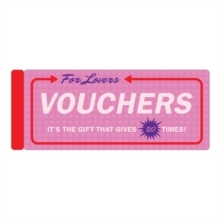 Offering a range of favours from road trips to foot rubs, our vouchers allow givers to express love in refreshingly nonmaterial ways. Their winning younger sibling, 100 Kisses, delivers instant gratification in an elegant retro package-and feature three ultra special, randomly placed golden tickets to sweeten the deal.